Oh, glorious sleep. It’s one of the most integral parts of a healthy routine, yet it evades so many of us! There are so many problems that arise. Some folks have trouble getting to sleep while others primarily struggle to stay asleep. Others simply wake up after what should have been a good night’s rest only to feel sort of foggy and exhausted in the morning. Any which way, a sleep problem is a sleep problem, and it deserves your undivided attention. Here at Happy Body Formula, we’re always seeking ways to address problems with a little tweaking to the diet. Food is an amazing tool for healing, supplementation, and problem-solving, so we asked: what are the best foods to eat before bed? We found a few easy answers here. Our rationale? Well, sleep isn’t only good for your health, but it’s incredibly important for overall energy levels, focus, and weight loss. Fatigue can set in and cause our hormones to get kinda wacky, leading us to those pesky and compulsive sugar cravings. We know that maintaining stable energy throughout the day also leads to more mindful food choices and less of a tendency to overeat. Plus, even without extra food, sleep deprivation can still mess with hormones involved with weight loss and weight maintenance, making it easy to put on fat and retain water. Many people are under the impression that eating before bed is inherently bad for weight loss, but that’s where things get tricky. It’s not black and white. In fact, many foods provide nutrients, vitamins, and compounds that aid in deep sleep and melatonin production – and they won’t cause you to pack on any extra pounds! Going to bed hungry isn’t always the answer. If you’re looking to revamp your bedtime snack, here are your best bets for weight loss and better zzz’s. Yoghurt is a light and healthy treat before bed. It’s healthy all times of the day, packed with protein, healthy fats, and probiotics, but it’s an especially good to get in some protein before bed, and yoghurt is a bit easier to stomach as a snack than eggs or meat for many. If you’re someone who eats dinner early or tends to get hungry before bed, this is a good choice for satiety if your hunger wakes you up in the middle of the night. It’s also a great vessel to get in a little something sweet if late-night sugar cravings are something you experience. Avoid added sugar in your yoghurt and opt for your own healthy additions. Yoghurt boasts tryptophan – an amino acid precursor to the hormone melatonin – which helps you sleep. Boost it up even more by adding a scoop of raw oats and some banana slices, both of which also contain tryptophan. You know how people joke about the Thanksgiving food coma? Well, there’s some truth to that, and it doesn’t lie in the endless feasting or dessert. Nope – it’s all about the poultry! Another protein option tops our list today for its tryptophan content, helping you to tap into that melatonin store and get your deep sleep on. Once again, eating protein before bed can be the key. While most people want to reach for something starchy or sugary, protein will help to stabilize blood sugar rather than spike it, helping you to avoid a crash while you’re asleep, which could wake you up. Plus, lean meat won’t add too many extra calories to your day, so this choice is fantastic for weight loss. Perhaps this one is more of a bedtime beverage than a snack, but it comes from cherries, so it counts in our books. Research indicates that consumption of tart cherry juice prior to bed can increase exogenous melatonin production. It was shown to improve sleep time and quality in both men and women. It can also help improve the availability of tryptophan, making it available to our bodies to use as a precursor to melatonin. It’s important to make the distinction between sweet cherries and tart cherries. Tart cherry juice has a very strong flavor, so go easy on it. For a bedtime routine, simply add a spoonful or two to a cup of water to get those sleepy chemicals rushing around in your brain for a good night’s rest. Almonds are a powerhouse of a snack any time of day, but they can be especially helpful before bedtime. This is due to a few things. First, almonds contain a healthy dose of magnesium which helps to relax the muscles and improve deep sleep cycles. It can even help with restless leg syndrome. Many people with this deficiency will suffer from poor sleep. Almonds also contain tryptophan and calcium, both of which help to produce melatonin. Lastly, they contain niacin – a B-vitamin – which aids in stress management and can reduce anxiety. We can easily link anxiety to insomnia and it can be a perpetual cycle, so getting in some stress-relieving foods can be important! Perhaps it’s time to consider a bedtime salad. Or, you could make a batch of kale chips which may be more snackable. Either way, leafy greens come in the clutch once again. Seriously – what aren’t they good for? We love our greens, and we love their endless benefits. Like almonds, leafy greens contain considerable amounts of calcium and magnesium. If you’re feeling particularly adventurous, it’s worth noting that turnip greens do contain some tryptophan. For a soothing bedtime ritual, wilt a variety of nutrient-dense greens in some bone broth and sip away for a warming and light sleep-inducing soup. When it comes to fish, it’s all about the vitamin B6! Salmon and halibut work as well, but it couldn’t be simpler to make it a bedtime staple than to have it in a can. 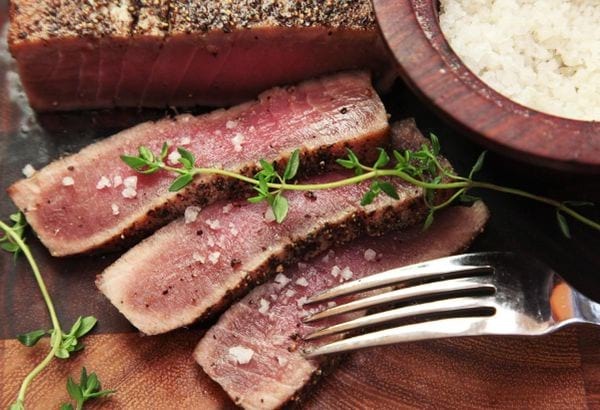 Some sustainable tuna is a really light, protein-heavy way to boost that vitamin B6 which helps the body produce both melatonin and serotonin. Without enough B6, the body can have trouble with tryptophan metabolism, so making sure you have the necessary components to absorb and use tryptophan is more important than actually getting it in your foods. If you want to double up, have some tuna over leafy greens with a light dressing. How could you not want to dig into one of these gorgeous little fruits before bed? These are a great way to curb your sweet tooth the all natural way without loading up on calories and sugar, and still getting those good snooze-worthy components into the mix. There are people out there researching pretty much everything, including kiwi’s effect on sleep. This study shows a drastic increase in sleep efficiency with kiwi, showing its potential for improving sleep onset and duration. And yes – you can eat the skin, so consider this an effortless and non-invasive supplement (that tastes really good!). A spoonful of nut butter helps the medicine go down… and your metabolism go up! It may seem indulgent, but there are benefits of peanut butter before bed. Load up a healthy spoonful or add some to a banana for a midnight snack that will help you lose weight. Peanut butter and other nut butters contain good-for-you fats and a dose of protein to help keep you satiated so you don’t go to bed on an empty stomach. It can also boost metabolism for effortless calorie burning at night while you sleep – no exercise required. It’s a pretty sweet deal. Make sure to source nut butters from nuts or seeds that agree with you, and find a brand that doesn’t contain any added sugar, which could easily negate the benefits. We slyly mentioned this fruit in combination with a few of our other snack suggestions, but we really wanted to focus on the effects of eating a banana before bed. It’s highly portable and it’s not messy, making it the perfect fruit to munch on before you snooze. Its benefits? Well, the mix of tryptophan and a hit of carbs is perfect for getting you drowsy. They also give us a little potassium and magnesium, both of which relax the muscles, helping you to get in the zone – the sleep zone. Finally, we have another friendly starch for bedtime! Slow carbs are perfect at night, and sweet potato is another favorite. These complex carbs promote sleep unlike quick carbs that mess with our blood sugar. Instead, they help repair and restore, enhancing all those great processes that go on when we hit the pillow each night. They have similar benefits to bananas with both magnesium and potassium. P.S. it’s perfect with some nut butter! A rather unlikely suspect at first glance, raw onion can get in the way of a good night’s rest. While not considered a bedtime snack for many, you still may find them as an ingredient in some of those leftovers you’re sneaking close to snooze time. Many raw veggies are difficult to digest, which can lead to uncomfortable bloating and gas at night which can definitely keep you tossing and turning. That pressure in the tummy can result in reflux, having you feeling the negative effects in your throat. People with heartburn may experience longer-lasting side and worsened reflux after raw onion consumption. Avoid salads or foods with raw onion as a garnish like guacamole or pizza. Some people crave sweet and others crave spicy. If you’re one of the latter, you might want to reserve those hot peppers and that glug of hot sauce for lunch time because spicy foods can fire up heartburn-induced insomnia. It’s true that spicy foods contain capsaicin which boosts metabolism, but that same compound can trigger heartburn and increase core body temperature, both of which are prone to keeping you up at night. If you’re sensitive to heartburn, skipping spicy foods at dinner or in your pre-bed snack can make all the difference. We’re hardly ever going to go around telling you that pizza is a health food, but we’re also not going to deny that it’s good. It’s especially good to grab a late-night slice and veg out a little before we hit the hay, but it’s not doing the body any favors (and it’s certainly not aiding in weight loss!). Pizza is a recipe for disaster, even if that recipe is also too-delicious-to-be-true. We have a few major components here including acidic tomatoes which can lead to uncomfortable and sleep-disrupting heartburn and potential gastrointestinal upset. Oh, and apparently, eating cheese before bed can give you weird dreams – science says so. There’s some trouble with carbs after dark, but it’s important to remember that not all carbs are created equal. It’s the high-glycaemic starches you want to watch out for. In one study, foods high on the glycaemic index disrupted sleep time, shortening it significantly. It’s best to avoid high GI meals up to four hours before bedtime because they can keep you up at night. We can likely trace this to blood sugar levels dropping in the middle of the night. This means you should also avoid snacking on potatoes, white bread, juice, and honey. Obvious? To some, it’s really not. We want to emphasise that even having caffeine after noon can make a huge impact on sleep, considering coffee’s long half-life. We also want to remind you that decaf contains trace amounts of caffeine, and if you’re especially sensitive, that post-dinner cuppa is not helping your tendency to toss and turn. Instead, opt for herbal tea and refreshing flavors like peppermint for an afternoon pick-me-up. Watch out for other sources of caffeine like chocolate, too! And there you have it! Snack smart – especially at bedtime. If you really want to revamp your routine, we have an entire sleep series included in our 7-Day Sleep Better Challenge that can help you reset and restore. Give it a go if you could use some serious beauty rest.